Lisa E Design Blog: See the Alligator? Alligators are common sights on Hilton Head Island and I guess in all of the Low Country. They crawl out of the lagoons and sun themselves on the bank. We give them plenty of room. It's a big island, lots of space for man and beast - especially one that can run faster than me and has way more teeth! In the video, I refer sometimes to the alligator as a crocodile. I do know the difference but I still get it mixed up in saying. When we were in Australia years ago, we had the best time one day on a tour of the rain forest with our own guide. The other couple, unknown to us, who had booked the guide backed out at the last minute so we got to ask as many questions as we liked and take our time. Lenny loved that day more than any and that is saying something in such a beautiful and interesting country. The only part I didn't love, other than parking in Melbourne, was when we were out on this boat in the rain forest trying to spot a croc. The mosquitoes had certainly spotted us and I was their lunch. The guide and Lenny saw a crocodile in the tall grass near the bank and pointed it out to me. Finally I said, "Oh, there he isn't, isn't that something?" They were satisfied but I didn't see that crocodile anymore than anything. I just wanted to get off that boat and away from those mosquitoes. Later on when we got our pictures back, I was going through them and found one with tall grass and asked Lenny about it. "Oh, there is the crocodile peeking through the grass. Remember?" "Sure, honey, whatever you say." 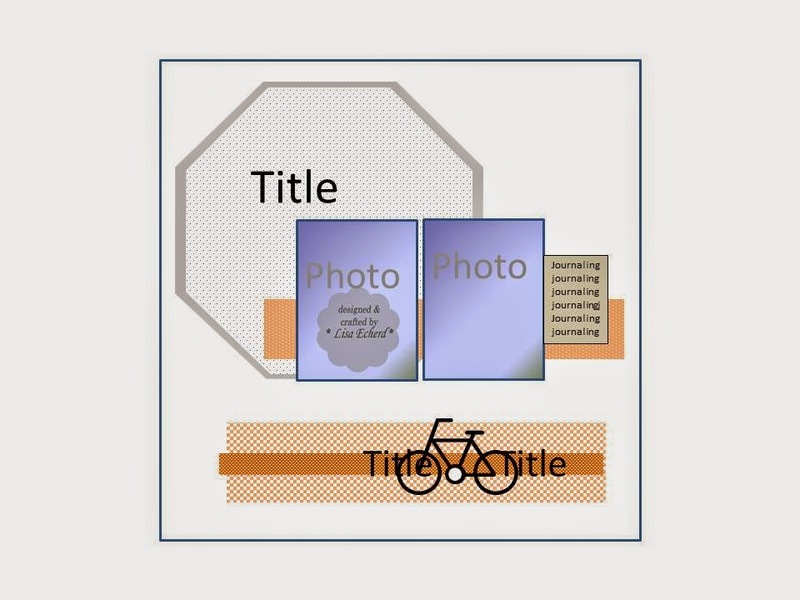 For the page, I wanted to emphasize the 'Stop and Look' theme as we were stopped when biking into this particular condo development. I thought we would be told not to enter though we have biked through there before. Instead he resident was just pointing out the alligator knowing we tourist like to get a photo. 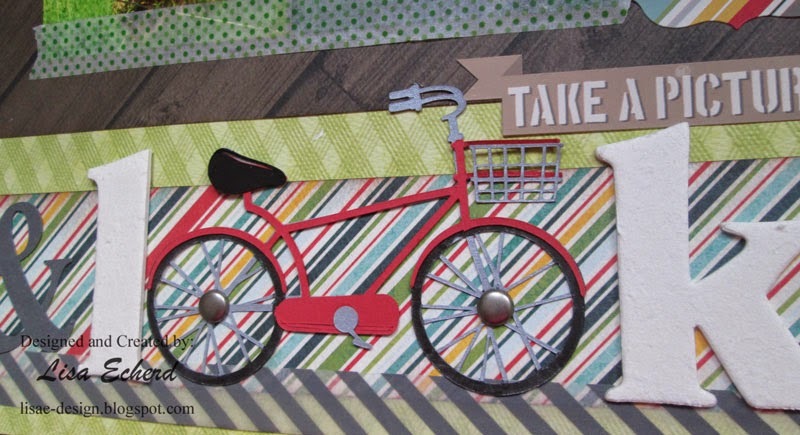 For "Look," I used a Silhouette cut bicycle for the 'oo'. I picked a pretty detailed bike but the machine cut it like a charm. I'm still getting the hang of assembling things or rather figuring out what pieces go where when I'm cutting things. I cut the main part of the bike from Stampin' Up! 's silver cardstock. I LOVE their silver and gold cardstock. It is so pretty and not the least bit delicate. You can use it just like any other cardstock. Look how the Silhouette even cut out the bicycle basket. Amazing! The July newsletter went out yesterday. Did you receive yours with the exclusive video on craft paint? Sign up on the sidebar. I usually do one resend later in the month. I love how you used the bike wheels as letters. Very cool idea. I am using "anonymous" as I do not know how to identify myself (Fern Assinewe). Wise choice to stay far, far away from that very fast critter on land! Love the bicycle wheels as the "oo". Thanks for sharing. Love that LO, from the giant stop sign to the bicycle "oo"! Such great elements on here, Lisa! 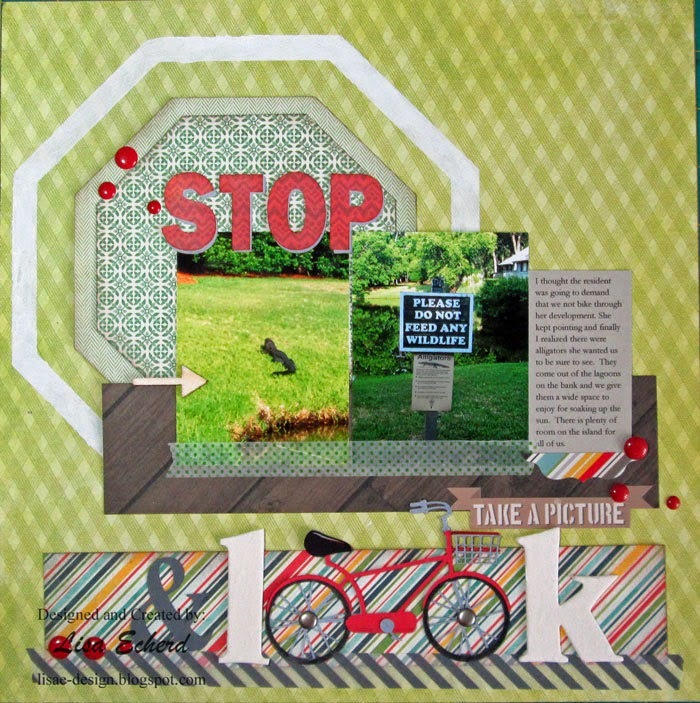 Love the big stop sign and the bicycle standing in for some of the letters in your title! Great way to document a memory from your vacation. LOL, I would have said anything to get away from those mosquitoes as well, lol.